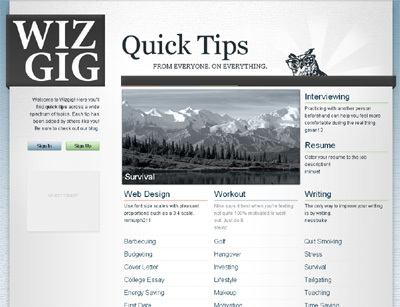 Wizgig is a place where you’ll find quick, useful tips across a wide spectrum of topics. Topics range from interviewing to web design to energy saving tips and more. Every topic contains numerous tips added by other users. These tips are short, 150 characters long at most, and are agreed to by other users. Tips that are most agreeable bubble up to the top of the page. Over time, this creates a situation where the best and most relevant information on a specific topic is presented to readers. While reading expert advice on topics such as weight loss is important, it’s often not the only source of good information. Wizgig takes both the expert advice and the wisdom of the crowd, and merges it into a forum where the best information bubbles up to the top of the page for a user to read.